Now that some parts of the country are warming with spring and summer coming, you may find yourself in need of proper safety vests before construction season is officially upon us. Warmer locations consistently must consider their safety with construction always able to go on throughout the year, but the northern US is now reaching the point where road construction is beginning again, and worker safety can be assessed and improved upon with Nite Beams™. With road construction in full-swing, Nite Beams™ can give you the best in the business of safety with our Hi Vis Class 3 safety vest. This vest is the ATSSA’s winner of the 2016 Product Innovation Award, making it the dependable safety vest that you can count on for you and your worker’s roadway safety. Specially designed for maximum visibility, the Class 3 safety vest from Nite Beams™ can give you the long-term safety you need when working long hours on roads during the night time. Our safety vests can also come in Canadian style high visibility designs. With the standard “X” cross pattern on the back with a 3M reflective strip, Nite Beams™ provides a compliant vest for any workers who want to be confident in their visibility to others. 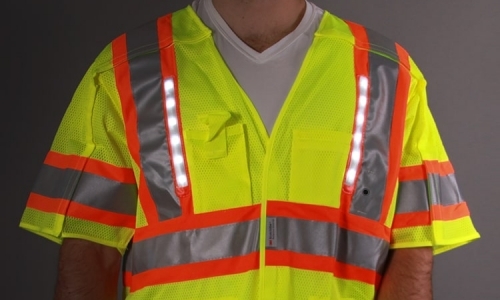 The strip combined with powerful LEDs guarantee a visible worker for any Canadian roadway. For extra coverage with your safety equipment, you can supplement Nite Beams’™ safety vests with the LED hart hat band. Also outfitted with a 3M reflective strip and high-visibility LEDs, the hard hat band adds another layer to your workers’ visibility. USB rechargeable, like our vests, you can use the hard hat band again and again, ensuring safety every shift. With safety equipment for roadway workers, law enforcement, traffic control, and more, Nite Beams™ has the dependable products your business needs.